A versatile platform for mounting a variety of hardware. The MX312P is a versatile platform for mounting a variety of hardware at any level on an isolation table or platform. A complete set of AS series spacers allows flexible vertical adjustment from 2.5- to 12.0-inches in 0.5-inch increments. To adjust the height of the platform, AS-1.5 and AS-2.0 series spacers are screwed together using 1⁄4-20 set screws. The top and the base plates are attached to the four columns with 1⁄4-20 cap screws through the counterbored holes. Smaller height adjustments are made by adding AS-.5 and AS-1.0 spacers to the top of the longer AS spacers. These are secured by the final attachment of the top plate with long 1⁄4-20 screws that go through the top plate and short spacers. The MX312P base plate is equipped with a unique hold down pivot that allows secure single bolt mounting anywhere on the mounting surface. The top mounting surface is 3.0-inch x 3.0-inch and has five 1⁄4-20 tapped holes for maximum mounting flexibility. The top plate is also drilled and tapped with 1⁄4-20 holes on two sides. These attachment points are designed to accept our MX-APC-T and MX-APT-T top plates. These adapter plates allow the experimenter to remove and replace equipment accurately and easily by loosening two flathead screws. The MX512P is a versatile platform for mounting a variety of hardware at any level on an isolation table or platform. A complete set of AS series spacers and hardware allow flexible vertical adjustment from 2.5- to 12.0-inches in 0.5-inch increments. 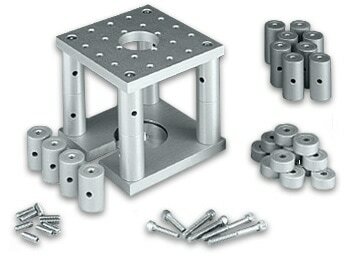 To adjust the height of the platform AS-1.5 and AS-2.0 series spacers are screwed together using 1⁄4-20 set screws. 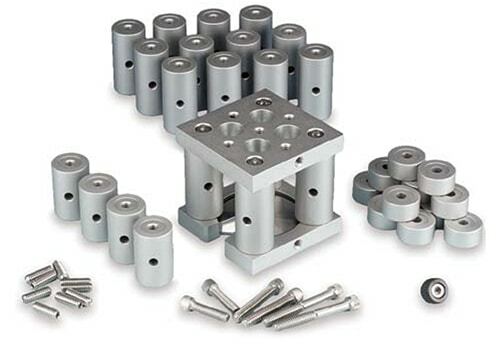 The top and the base plates are attached to the four columns with 1⁄4-20 cap screws through the counterbored holes. Smaller height adjustments are made by adding AS-.5 and AS-1.0 spacers to the top of the longer AS spacers. These are secured by the final attachment of the top plate with long 1⁄4-20 screws that go through the top plate and short spacers. The MX512P base plate is equipped with a unique hold down pivot that allows secure single bolt mounting anywhere on the mounting surface. The top mounting surface is 5.0-inch x 5.0-inch and has twenty 1⁄4-20 tapped holes for maximum mounting flexibility. 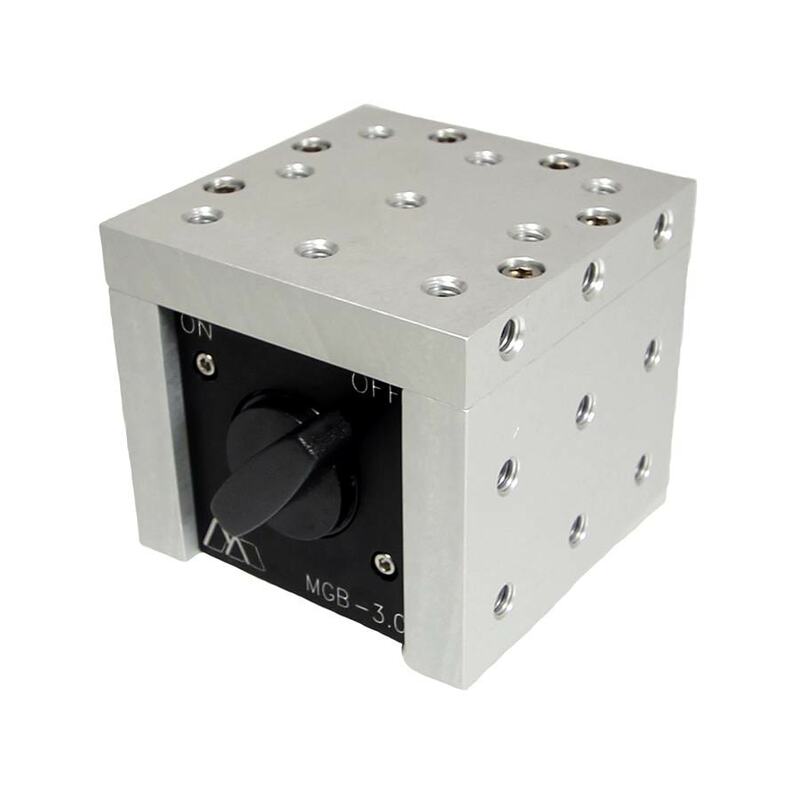 The top plate can be used as a stand-alone platform for mounting MX310 micromanipulators next to microscopes. This robust platform can hold many small devices or larger ones up to 300 pounds. 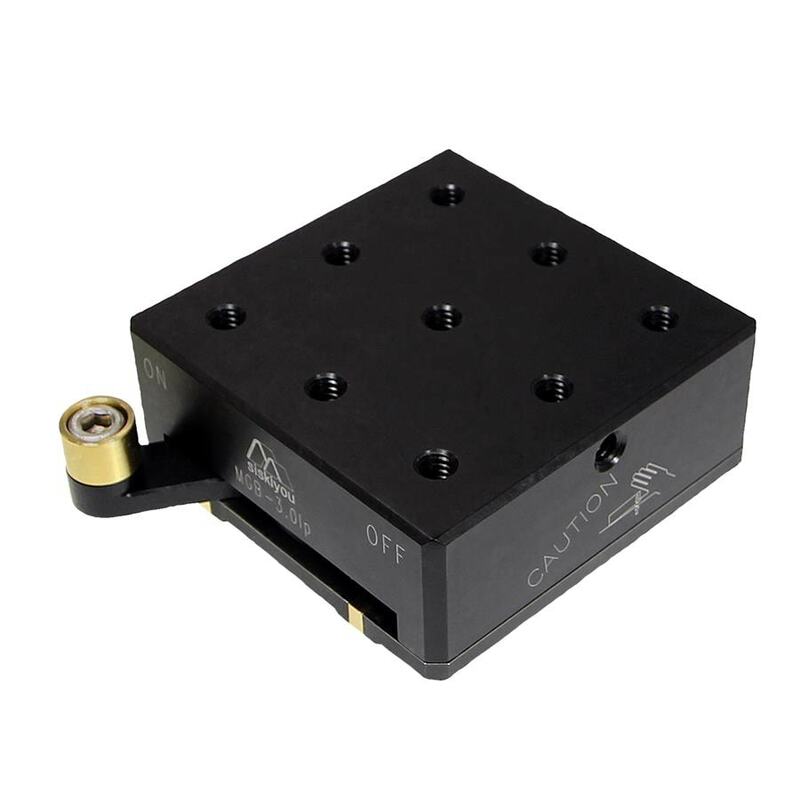 The MGB-3.0lp magnetic base is designed to be used as a stable mounting platform for isolation tables lacking mounting holes, or on any magnetic surface. The magnetic field of the MGB-3.0lp is activated through 60° rotation of a manual lever that is clearly marked ON and OFF. The MGB-3.0lp’s 3.0-inch x 3.0-inch mounting surface is the perfect match for mounting our 331 stages, 831 stages, MX312P platforms, or MX3T tilt platforms. The MGB-3.0lp is also compatible with our MX-AP series top adapter plates. These adapter plates allow the experimenter to remove and replace equipment accurately and simply by loosening two flathead screws. The MGB-3.0 magnetic base is designed to be used as a stable mount­ing platform for isolation tables lacking mounting holes, or on any mag­netic surface. The 3.0-inch x 3.0-inch footprint has greater surface area and is more stable than similar magnetic bases. The magnetic field of the MGB-3.0 is activated through 45° rotation of a manual lever that is clearly marked ON and OFF. The MGB-3.0’s 3.0-inch x 3.0-inch mounting surface is the perfect match for mounting our 331 stages, 831 stages, MX312P platforms, or MX3T tilt platforms. Three sides of the magnetic base have nine 1⁄4-20 mount­ing holes for added attachment flexibility.